Home » Posts tagged "starship"
In the last progress update I addressed the creation of the escape pods and the piece of the hull section corresponding to the pods. This time I am going over the modeling of hull behind the Escape Pod section and including the basic design of the sub-light engines. 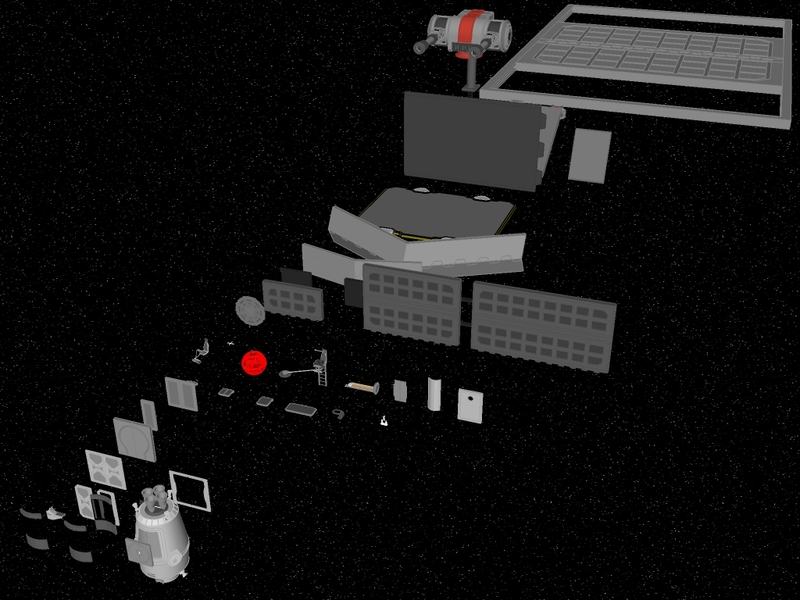 A lot of work on the model has been done beyond what will be covered in update so I am running behind on the updates. But, it’s not like there is a deadline on a hobbyist project like this… Now that the ship is really starting to take shape I am now posting pictures throughout the updates. This time around I made a lot of progress on the model’s interior. In my last update I said I was going to work on the engineering and cargo section but I didn’t stop there. I did some preliminary work on the Bridge, designed the Turbolifts twice, modeled some interior windows to allow viewing of the Landing Bay and Engineering Room, designed the Sleep Pods for the Bunkrooms and made the Briefing Room much larger. While working on all of those aspects, I also reconfigured the layout a bit to make things more cohesive with what I envision the ship looking like. I now think the model is almost too big for SketchUp to handle so expect some growing pains in the future. In the Engineering Room I accomplished putting up all the basic wall panels and implementing the enclosed catwalk that will surround power core allowing unauthorized passengers to bypass the engineering room. The floating catwalk is based directly off of the design of the catwalk above the Landing Bay. In addition to the straight sections there are corner sections allowing for 90 degree bends. Initially the catwalk was to be a true circle around the power core but I decided it was too complex to make and would take away from the theme of modularity. I could have done it, but I didn’t want to devote too much time to doing it. After the floating catwalk was done I added some support struts to, you guessed it, support the weight of the catwalk over the floor of the Engineering Room. After working on the Engineering Room I started on the Entryway which will serve as the main entrance for the ship and access point for the cargo bays when landed. When it comes time to work on the ship’s exterior the loading ramp will be added. The first thing I did here was to create an enclosed catwalk along the ceiling that will eventually provide access to the maintenance ports for the sub light engines to be added later. Once that was done I put up the wall panels. I then modeled the bulkhead doors for the cargo bays. At the front of the entry I added two small rooms that connect to the Engineering Room. The next step was to add the wall panels to the cargo bays. I decided to do some work on the main bridge but only as much as I could do since there is no outer hull. All I did was added the wall panels for the back and side walls and model the floor for the upper level. Next I went to work on creating the Turbolifts. At first I was lacking inspiration so I made a big square box of a turbolift. I’m not go into much detail on their design because I ended up scrapping their design. But, before I made the decision to scrap them I worked on other parts of the ship. I did some thinking about the Briefing Room and I thought there should be some windows for observation of the Landing Bay. For the windows I simply modified the standard bulkhead door to have a pane of transparasteel in place of the door. I added the windows to the back wall of the Briefing Room’s second level. I also added these windows to the turbolift rooms in the entry area. This allows observation in to Engineering Room and into the entry area. The next things I decided to work on were the sleeping pods in the bunkrooms. The bunkroom will be the sleep quarters for the starfighter pilots/flight crew and for the engineering crew. The reason I decided to make pods instead of bunks was to save space. Their design is based directly off the sleeping pods used in the Kamino clone training facility as seen on Star Wars: The Clone Wars Season Three. I scaled mine a little smaller to fit my standard wall panel dimensions. The inside of the pods are actually pretty spacious inside and include a ceiling mounted computer terminal and a storage cabinet for personal belongings. They kind of resemble an MRI machine but that is purely unintentional. The Briefing Room seemed too small so I doubled its size and put up it’s wall panels. I then extended the second level around the perimeter of the room. I then added an inner wall on both levels as a back drop for the speaker’s podium. It also creates a buffer zone for the entrance into the room. I also added a entry door for the upper level. The final thing I worked on was redesigning the Turbolifts. The reason I didn’t like what I first designed is that they completely blocked the view down the corridors and they just looked boring. The new turbolift design is round and see through and a lot better looking. There will probably be many other components that I will end up changing in some way. What’s next? I’m really not sure. I might add some color because all the white is starting to irritate me. I will probably finish the rest of the basic wall panels before doing much else. It won’t be too long until I begin on the exterior. Now that my first starship model (the 210CR) is finished I have decided to start on a new one. This time around I have decided to create something much bigger: a capital ship. By definition a capital ship is an armed military vessel with a length of 100 meters or greater. Based on the work I have already done it is currently 236 meters long which is 86 meters larger than the Tantive IV Corellian Corvette that I used as a benchmark for my last starship. It will have many of the same features as the 210CR but on a much larger scale. In addition to those features it will have 3 full decks, a hangar/landing bay for a small complement of star fighters and a shuttle or small freighter (must fit Millennium Falcon), retractable laser cannons, traditional Star Wars style escape pods, robust landing gear and more viewports this time. It will also have a more complete engineering section including backup power cells, life support systems, garbage compactor (dianoga free) and water treatment facilities. So far I have modeled the general design of the interior walls, the bulkhead doors for the rooms and main corridor, and created the empty rooms and bulkhead sections. I decided to continue the idea of keeping my ships modular. This time around I expounded on the idea by creating a layout grid of 4’x4’ squares spaced apart by 6 inches that every wall panel, fixture, door will strictly line up with. Each wall module will be four feet wide and nine feet tall. Each basic wall module will consist of a top and bottom light bar for ambient lighting that are both 6 inches tall and a 4×2 grid of 2 foot square wall panels. These standard 2 foot square panels can then be replaced with additional modules that fit the 4×2 grid configuration. Between each wall module will be a 6 inch wide divider. When a perpendicular wall is added, it will take the place of the divider this will prevent the need for fractional wall panels. The bulkhead doors I for this ship are based on the design of the ones from the 210CR with the exception that there is just one layer of doors instead of two. The corridor bulkhead section doors function the same way as the ones on 210BR but are designed more similar to the room bulkhead doors. The openings of the corridor sections are arched and have cowlings that are reminiscent of the ones seen in the Millennium Falcon. With modularity being key to the design of the ship I have created standard rooms/bulkhead sections that all align with the layout grid I have established. Each room section is spaced apart precisely to fit the layout grid. These standard room sections have cutouts with matching plugs for multiple bulkhead door configurations. This makes it so the standard room shapes are versatile for any type of room. All non standard bulkhead sections will also align to the layout grid. To assist me in the layout of the ship I have created a rudimentary drawing in Photoshop with guides arranged in the layout grid I chose. This allowed me to visualize and plan where the bulkhead sections will be. I then finished creating the bulkhead sections for the ship and arranged them according to the drawing. After doing this I quickly realized that the bulkhead section for the hangar/landing bay was much too small to accommodate star fighters and the Millennium Falcon comfortably so I moved things around and significantly enlarged the section. This currently makes the ship appear to be pregnant but I will try to balance it out soon.